There has been a considerable increase in scholarship investigating the application of legal and canon legal norms in recent years and its impact on larger medieval cultural questions. In this vein, both Craig Nakashian’s recent volume and the 2013 volume by Lawrence Duggan interrogate the ways in which clergy engaged with the internecine military conflicts that suffused their environment. Where the two volumes differ, however, is their approach, and it is in this respect that Nakashian’s work provides a splendid compliment to Duggan’s work. Although this review concerns Warrior Clergy in Medieval England and not Armsbearing and the Clergy, there is a clear link between the two and Nakashian’s work coexists well within the present scholarly dialogue about the complexity of clerical normativities in the Medieval Latin west. In this light, his work is—one can hope—the first of a series of volumes to articulate the same themes “on the ground” that Duggan played out in the theoretical discourses of the canon lawyers in his 2013. For such an effort, Nakashian deserves the considerable thanks of scholars working both on the phenomenologies of clerical life and for scholars working on the history of the world of the Angevin Empire. 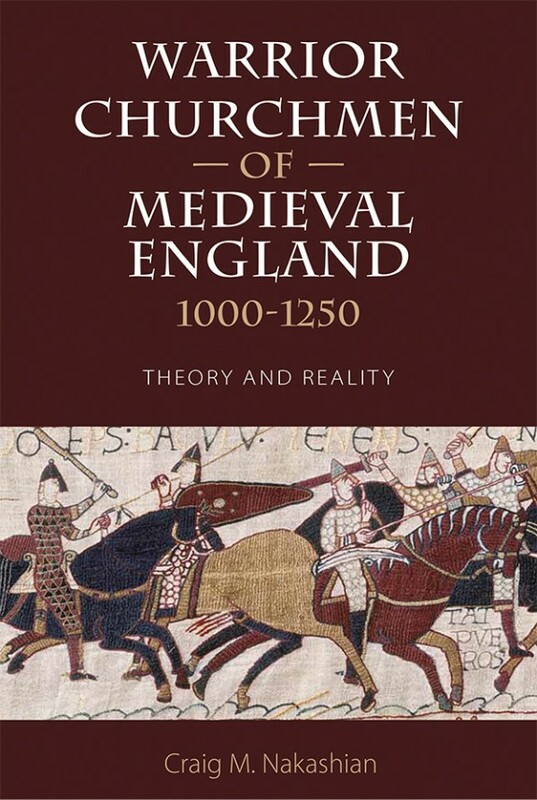 The essential point of Nakashian’s work is to explore the complex portrayals of clerical armsbearing in the cultural sources of the medieval Anglo-Normal World. Along the way, he articulates a nuanced argument about the potency of clerical armsbearing as a literary trope, a practiced phenomenon, and a political tool, all of which were manipulated and shaped by contemporaries to achieve their own specific objectives. There are two main parts to his work. The first is a survey of the pertinent sources about clerical armsbearing. He lays out the first millennium of Christian evidence rapidly in the first chapter. In the second, he surveys the canonical and papal norms “at the center” in order to set his work in dialogue with the legal evidence mined by Duggan. The third chapter betrays the difference in emphasis between Nakashian and Duggan, because Nakashian spends the bulk of the third chapter examining the evidence from chivalric literature to detail the ways in which clerical armsbearing was portrayed by poets and authors; this provides, for him, a more potent entrée into the world of the medieval aristocrat and thus into the realm where ideas about clerics were shaped and received, especially but not exclusively by a non-clerical audience. Having laid out the methodology and variety of sources that inform his later analysis, Nakashian then moves to a series of chapters that read like extended case studies of periods and personalities in the second part. The division of his chapters in the second part is straightforwardly chronological. There are five chapters that break down the history of medieval England. Two for the Norman Conquest and early Norman kingdoms, one for the Anarchy, and two for the early Plantagenets. These chapters demonstrate that Nakashian’s larger purpose is not to catalogue activities, but to discuss their significance as a marker of a larger discourse around clerical armsbearing. The fourth chapter begins Nakashian’s extensive analysis of the Norman kings’ clerical warriors. Appropriately enough, the chapter commences with an examination of three of the major clerical players in the Norman Conquest of England. On the very first page of the chapter, he lays out his larger purpose of that chapter and the second section of the book as a whole, demonstrating that clerical warriors shared “a unification of purpose between the chivalry of the high nobility, and success at the highest levels of the ecclesiastical hierarchy.” (125) Of course, no such unity was expressed in stark terms in the early period, nor was one expressed in the larger discussions of later eras. However, by focusing on three individuals, Nakashian bears down on the evidence for individuals. In many cases, the scholarship cited in his footnotes explicitly disagrees with his contentions. Revisions of master narratives tend to look quite like that. The pertinent question to ask in such a case is whether that revision is necessary. As Duggan has already shown that the legal mechanisms for defining clerical armsbearing experienced a major shift in the mid-twelfth century, it stands to reason that the momentum toward change was evident prior to that point. 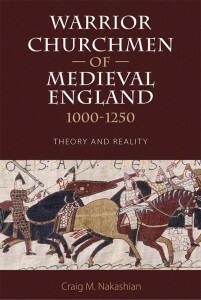 In this regard, the fourth chapter suggests that revising the portrait of the interaction between clerics and seculars in the Norman Conquest and the early campaigns in its aftermath was where the position of the clerics was noble or condemnable with regard to which side they aligned themselves. The norms, for chroniclers and contemporaries, were determined not by legal calculations but by political and cultural ones. If such a revision were to be justified, that justification would be validated by the repetition of such a trend. The fifth and sixth chapters of Nakashian’s volume, together, examine the ways in which the aftermath of the Norman Conquest became solidified in what he calls a “New Reality” and how these were challenged by the Anarchy. By examining both hagiographical and historical accounts and working with them as though the texts were in a constant discourse, the “New Reality” section will likely continue to provoke the kind of substantial debate that it already has among the members of De re militari, but this discussion also presents a number of thoughtful observations about the ways in which contemporary realities inflected the commentary of clerical authors. What made some of these tensions remarkable was the timing of their accounts, a fact which Nakashian emphasizes: “Most observers were more horrified by a cleric who looked and acted like a knight during peacetime than they were by one who manfully defending his king during war, but who otherwise was a conventional member of the ecclesiastical ordo.” (183) This was the ethic tested by the Anarchy and clerics participating in that conflict. In this manner, there were a number of clergymen who were described in a variety of tones by contemporaries and later chroniclers. In that regard, there was no “one size fits all” treatment of clerical warriors, but Nakashian’s argument is well-supported by that very fact that such a diversity of narrative elements were presented for clerics on both sides. The Angevin Empire, the subject of the seventh and eighth chapters, suggests that the same tensions between “right” and “wrong” sides in a conflict determined whether clerical conduct was considered just or unjust by contemporary chroniclers. Defense of the realm and its interests was laudable, so long as it was balanced. In the case of Geoffrey Plantagenet, complaints about his military service was part of a laundry list that began with his ignoring his episcopal duties. Similar complaints were made against Ramón de Minerva of Palencia decades earlier, but the weight of the papal letter focused on the bishop ignoring his administrative and pastoral duties. The same effect was achieved by Celestine’s letters about Geoffrey, which suggest that his conduct was merely out of place in peacetime rather than wholly beyond the scope of potential activities. Because scholars, working both on historical subjects and the metahistorical theoretical discourses, have long shown that what was written down in historical narratives was merely one part of a larger phenomenon that produced that discourse. When it came to crusading clergy, armsbearing was not controversial and could even garner praise; that functional tension suggests that the conversation about these prelates was informed and inflected by much more complex discourse than scholarship from the previous century had earlier observed. Craig Nakashian deserves to be congratulated for providing a series of case studies about a phenomenon—clerical armsbearing—that unites a variety of themes important to medieval historians and the medieval peoples under study by professional scholars. There are, to be fair, items that deserve greater scrutiny than Nakashian was able to provide because his purpose was to provide a complex and thoughtful analysis rather than an exhaustive study of single figures. The examples of Thomas Becket or Anselm of Bec or Odo of Bayeaux could be subjects of books on clerical armsbearing on their own merit, as they have been on a host of other subjects. In taking a broader view, Nakashian’s work pushes for a revision of the manner in which we contextualize and examine clerical figures in the context of the medieval world. Revising earlier historical narratives—held up as observed norms and codified in surveys and textbooks—takes time, but even if Nakashian is not successful in convincing all medieval historians interested in his volume, moving the debate away from codified norms and into observed practice is a laudable goal in its own right. As a reviewer, I am convinced that this volume will help propel further interest in and debate over the clerical practice of armsbearing in the medieval world. While some elements of the book could have been expanded, five-hundred page books are neither fashionable nor desirable the digest of the available evidence produced by Nakashian is both desirable and likely to be imitated and cited by scholars working on clerical custom and behavior for the foreseeable future.